This dramatic fortified hilltop and village once commanded much of Provence. It is now the titular home of the Crown Prince of Monaco. 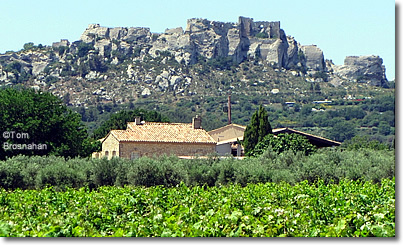 The dramatic medieval natural fortress of Les Baux-de-Provence is a high-point in Les Alpilles, the range of low mountains 19 km (12 miles) northeast of Arles (map). 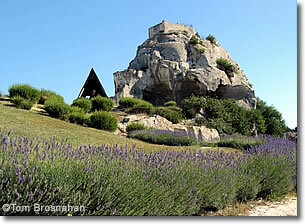 The picturesque village of Les Baux straggles along narrow streets on one side of the limestone outcrop. Shops selling handicrafts and local products dot the way up to the fortress, along with cafés and restaurants offering sunny—or shady—places to sit, sip and dine, depending on your preference. Many of Les Baux's smaller churches and historic buildings are now museums and galleries. 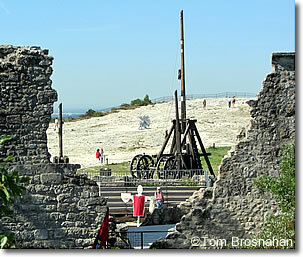 At the top of the outcrop are the remains of the fortifications, along with replicas of medieval war machines: ballista, bricole, couillard and trebuchet. Les Baux-de-Provence is the major tourist destination in Les Alpilles, and quite crowded every day from June into September. Avoid visiting on weekends, and do your best to arrive early in the morning in order to get a place to park—parking is very limited. The medieval lords of Les Baux were among the most powerful rulers of Provence, and their natural castle, reinforced with mighty stone walls and engines of war, was continually beset by battle and siege from the 11th to 16th centuries. By the early 1600s, the lordship of Les Baux had passed to the French crown, and Richelieu had its walls pulled down to prevent rebels or rivals from causing more trouble. In 1642 the king of France granted the town and fortress to the Prince of Monaco along with the title Marquis des Baux. The Grimaldi family of Monaco has since used this French title to indicate the heir to the Principality of Monaco. Though there is no longer any legal connection between Les Baux and Monaco, Le Baux still holds a special place in the hearts of the princely family. the fortress at Les Baux-de-Provence.